In response to questions about President Trump’s expansion of immigration enforcement priorities, White House press secretary Sean Spicer claimed three times that there are somewhere between 12 million and 15 million — “potentially more” — people living illegally in the United States. During the campaign, Trump claimed that the number of unauthorized immigrants in the United States could be anywhere between 3 million and 30 million. (PolitiFact rated that Pants on Fire.) Spicer’s claim was not as outrageous but still is questionable. We reviewed the facts. But that 15 million figure was inconsistent with Department of Homeland Security estimates of 11 million. After the hearing, ICE played down Saldaña’s statement, saying she “was citing it only informally,” the Washington Times reported. Spicer also noted a 2013 article about the National Association of Former Border Patrol Officers disputing demographers’ estimates of the roughly 11 million undocumented immigrants. The group said that “the more likely figure is 18-20 million and rising daily,” but there was no data to support that. Research from DHS and a handful of independent demographers calculate the unauthorized population as between 10.9 million and 11.9 million between 2012 and 2016. These estimates use data from the Census Bureau, which does not ask foreign-born people whether they are in the country legally or illegally. In general, researchers subtract the number of legal immigrants (lawful permanent residents, asylees, refugees, people with temporary visas) from the total population of foreign-born people, then adjust it for the census undercount. This formula has been used to measure illegal immigration for at least 30 years. The highest end of the calculation comes from the Center for Immigration Studies (CIS), which supports reductions in legal and illegal immigration and is the Trump administration’s go-to source for immigration data. The three other estimates are based on the American Community Survey; the CIS estimate is based on the Current Population Survey, which is a smaller data set and therefore has a greater margin of error. Census data from 2014 and 2015 show an increase in new arrivals, partly because of temporary visa holders (for example, guest workers and foreign students), said Steve Camarota, CIS director of research. Given uncertainties in estimates, the figure could be in the 12 million range, he said. Spicer’s statement that there are about 12 million people in the country illegally is safely within the margin of error in credible demographics research. But once he enters the realm of “13, 14, 15 million” or “potentially more,” his claim becomes problematic. Spicer cited testimony by the former ICE director under the Obama administration, who said the unauthorized population could be 12 million to 15 million. But that figure was inconsistent with official DHS estimates, and ICE walked back her claim immediately, saying she referenced it “informally.” Spicer also pointed to a 2013 claim by the National Association of Former Border Patrol Officers that the “more likely figure is 18-20 million,” but that is not supported by demographics data. Research from DHS and independent research groups estimate the unauthorized population at just over 11 million, plus or minus 1 million. The number could be as high as 12 million. Even calculations by the Center for Immigration Studies, which the administration frequently relies on as its source for immigration data, said any estimate of 13 million or more is not credible, given the flows of unauthorized people. 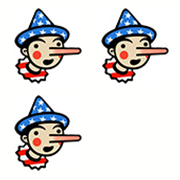 Spicer’s claim does not rise to Four Pinocchios, but he would be on factually safer ground sticking to the 12 million figure, rather than some one-off reference made by a since-departed Obama administration official. Even better, since he is the chief spokesman at the White House, Spicer could cite the official U.S. government estimate of 11 million.